Turkish President Recep Tayyip Erdogan has acquired unprecedented political power and is determined to realize his personal preferences in both Turkey's domestic and foreign policies. Turkish President Recep Tayyip Erdogan's hostility toward Israel can be puzzling at times. When his Justice and Development (AKP) party rose to power through democratic elections in 2002, ties with Israel had been solid for a number of years. Erdogan visited Israel himself in 2005. His government purchased weapons from and held joint military maneuvers with Israel. Under Erdogan, Turkey attempted to serve as mediator between Israel and Syria and expressed interest in collaborating with Israel on projects to benefit Palestinians. Economic ties between the two countries continue to flourish, and Turkey's official airline operates around 10 flights per day between Tel Aviv and Istanbul. 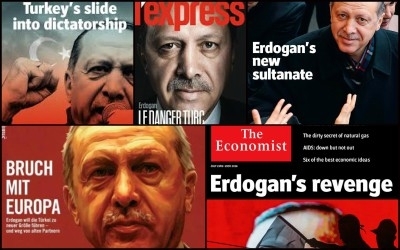 The reasons for the change can be found in Erdogan's personality and Turkey's strategic environment. Erdogan has acquired status and unprecedented political power, and he is fearlessly working to realize his personal preferences in both Turkey's domestic and foreign policies. Erdogan's treatment of the Jewish state stems from his negative opinion of Jews in general. Erdogan had issues with anti-Semitic remarks in the past, which stem from his Islamist education and the anti-Jewish atmosphere in Islamist circles in Turkey. Many in those circles believe that the founder of modern Turkey, Mustafa Kemal Ataturk, was secretly a Jew. They see Jews as having been a central agent in Turkey's process of secularization under Ataturk, a process they consider destructive. Therefore, Jews are the bitter enemy sabotaging Turkey's Muslim identity. Erdogan and other Islamists see Jews as a bitter enemy sabotaging Turkey's Muslim identity. A shrewd politician, Erdogan is aware that his anti-Semitic positions earn him praise that translates to votes come election time. Opinion polls from the previous decade indicate that around half of all Turks do not want a Jewish neighbor and believe Jews are disloyal to the state. In Turkey, anti-Semitic sentiments are no longer politically incorrect. Another important factor behind the poor relations between the two countries is Turkey's desire to wield influence in the Middle East and throughout the Muslim world. Turkey's foreign policy has broken off from the Kemalist outlook that saw ties with Middle Eastern states as a cultural and political burden, and Turkey now draws more from its imperial Ottoman heritage. Under Erdogan, Muslim identity plays a large part in Turkey's foreign policy. The desire to become a regional and global leader demands that Turkey lower the profile of its relations with Israel. At the same time, Turkey is distancing itself from the West, and the United States in particular. With the fall of the Soviet Union, there is less strategic need for NATO membership, especially given EU opposition to Turkey joining the organization. Alongside a weakened EU, America's diminished presence in the Middle East under former President Barack Obama and now under President Donald Trump has bolstered the Turkish trend of deviating from the West in its policy on Israel. And yet Turkey maintains diplomatic ties and excellent financial ties with Israel, which has a vested interest in ties with as important a Muslim state as Turkey. While Israel cannot let Erdogan's attacks slide, its response must differentiate between Turkish society and its popular but problematic leader. The struggle for Turkey's identity is not over. Only half of all Turks voted for Erdogan in the last elections. In the Middle East, countries that can afford to oppose Erdogan are few and far between. Turkey and Iran are historic rivals, and tensions between them also stem from the Sunni-Shiite divide. Today, Turkey cooperates with Iran, largely out of both countries' concern over Kurdish nationalism and the Muslim character of their foreign policies. In the future, Turkey may decide to oppose Iran's expansion and as a result improve ties with Israel. The international reality is fluid, and Israel must keep all options open.